Available in three widths, with two depth options. Napoleon knows that with an electric fireplace, you want to see the hearth, not the frame. The Napoleon Slimline Alluravision 42 Inch Electric Fireplace with Heater is a slim, but attractive fireplace that you can either hang or recess into a wall for the perfect addition to your home. Thanks to its 5,000 BTU output, it can heat up to 400 square feet with no trouble at all. 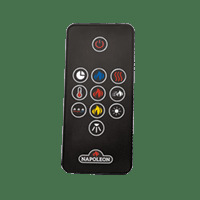 If you want an electric fireplace with extra customization available, this is the right one for you with a variety of flame colors with adjustable brightness and warmth. Enjoy this slim and functional fireplace without the hassle of traditional fuels from Napoleon!